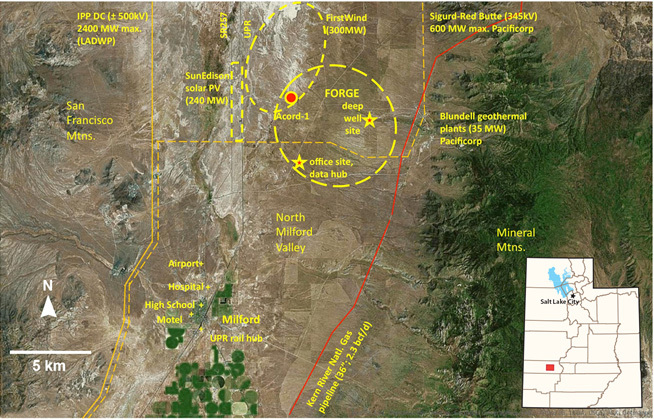 The Utah FORGE site is on private land close to major paved roads, graded dirt roads, an airport, and a rail line. It is accessible year round, with infrequent rain or snow fall. Lodging and eating establishments are available 16 km (10 mi) away in Milford, or in the larger community of Beaver, Utah, located 50 km (31 mi) further and adjacent to Interstate I–15. Beaver is a 3 hour, 320 km (200 mi) drive from Salt Lake City. Milford is a small agricultural community with a population of 1400 people. The Milford Municipal Airport, located a few miles north of town has a 1524 m (5000 ft) paved runway that can accommodate piston or turboprop single- or twin-engine planes. The area contains no state or federally protected flora, fauna, or historical sites. Use this ArcGIS interactive map to view the site.